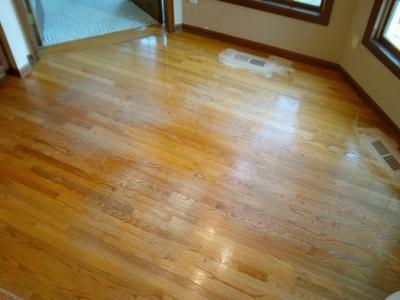 "Our Floorwright, Jerry, did a terrific job. His experience and meticulous craftsmanship really show. He worked with us to help select just the right finish product based on our use and habits. We decided on WearMax ceramic finish and we are pleased with both the look and the slight traction it provides. It is entirely compatible with LOW VOC ShadeMaker Wood Stains which helped us find just right color and sheen so that our floor works beautifully with our Cherry cabinets. He also helped keep the mess and inconvenience to a bare minimum." Thank you for the kind words. 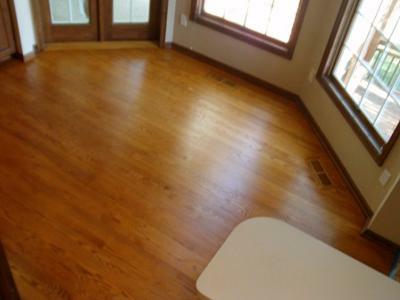 Those worn areas below the dinette chairs were the biggest reason you decided to refinish your wood floors, I am sure. However, it was also fun to see you pick a new color more to your liking and that, of course, is another good reason to refinish wood floors. You also were very keen on the idea of a slip-resistant floor. Glad to be able to offer that. From what I hear, that is a growing concern and there are big differences between floor coatings in this regard. 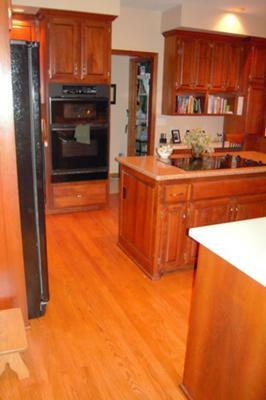 I love low voc wood stain and finish. ShadeMaker Wood Stains are 230 VOC. Unheard of, especially in such warm tones. The finishes you chose are even lower. Nothing over 125 VOC, as I recall. These products, along with dust containment equipment, have extended my career. and just might put off your next wood floor refinish forever. Did you come up with any solutions for keeping the beads from falling on the floor?